The system had its origins from early efforts dating to the 1920s and the development of the Tracer Index, a forerunner of the Fine Fuel Moisture Code (FFMC). The FWI system was developed and introduced across Canada in 1970. Due to its simplicity in terms of data required and outputs produced, it is used both globally and within many regions around the world. The FBP system tools were released in interim form in 1984, with a more formal introduction in 1992, and revisions in 2008. Additional systems for fuel moisture (e.g. hourly FFMC and Grass Fuel Moisture) and ignition have followed. There are several important distinctions for NFDRS and NFBPS users. All the CFFDRS tools and references produced by the Canadian and Provincial governments, as well as applications produced internationally, use the metric system for all measured values. For the most part, measures referenced here are in English units to facilitate utility and use in the United States. This table provides a quick reference to aid conversion between 10m, 20ft, unsheltered Eye Level (EL Op) observations, and Forecast/Airport winds. 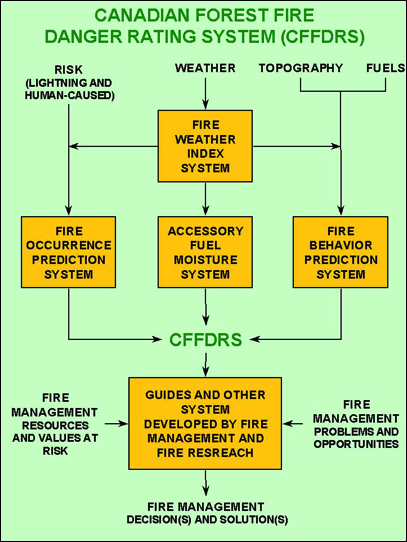 CFFDRS weather observations, provided to the system for both FWI and FBP calculations, generally conform to familiar fire weather standards. These standards can be reviewed in the weather guide table referenced above. 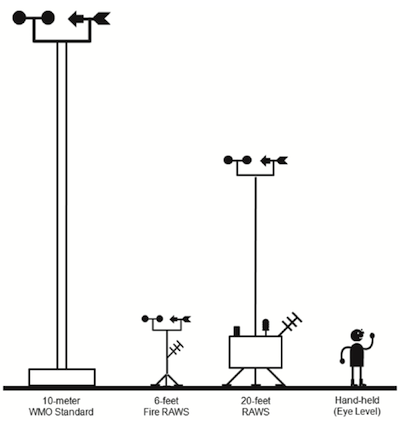 However, wind observation standards conform to the international 10m height as opposed to the NFDRS 20-foot height standard. 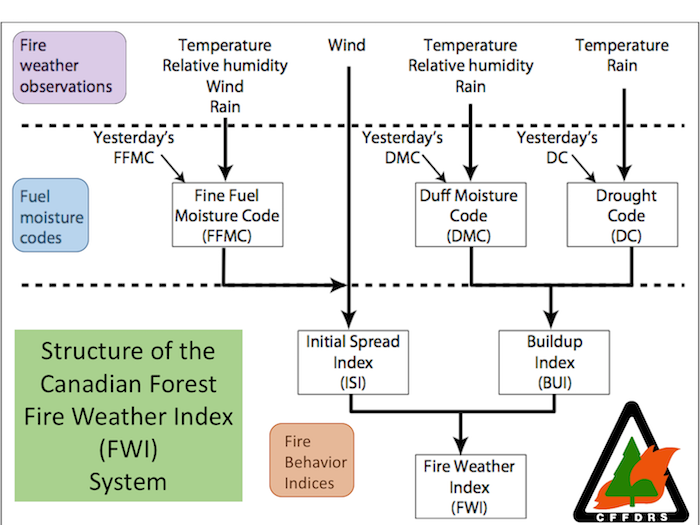 CFFDRS models and tools do not expressly apply relationships between the standard 10m wind measurements and others that U.S. users may be familiar with. Both 20-foot and eye level winds are commonly referenced and reported from U.S. RAWS observing locations and from the fireline. 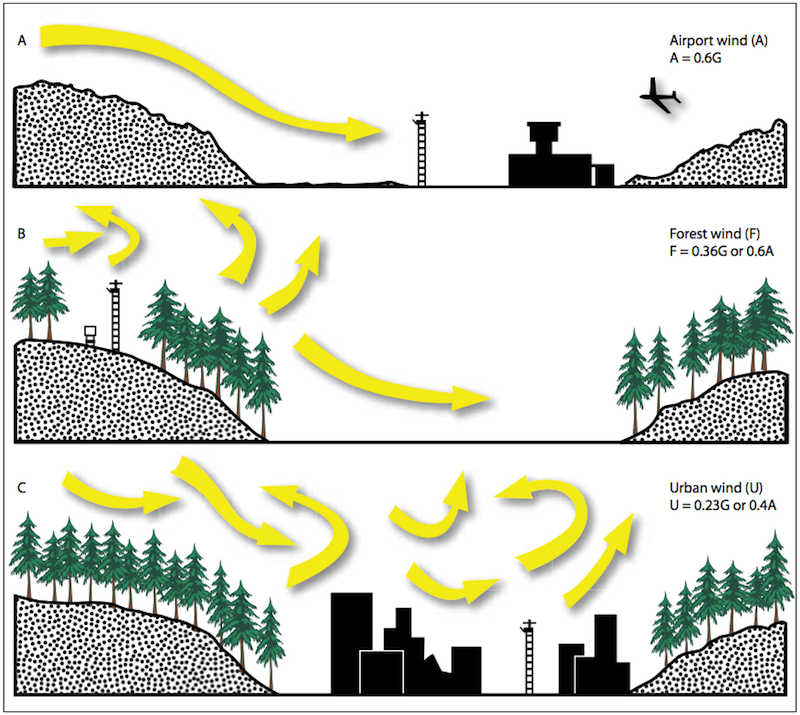 Further, wind speeds reported from Airport ASOS (Automated Surface Observing System) and provided in National Weather Service forecasts generally report higher wind speed, where surrounding terrain is flat with little variation in vegetation height or structural interference, and is highly correlated with forecast wind speed provided in the National Digital Forecast Database (Lawson and Armitage, 2008). 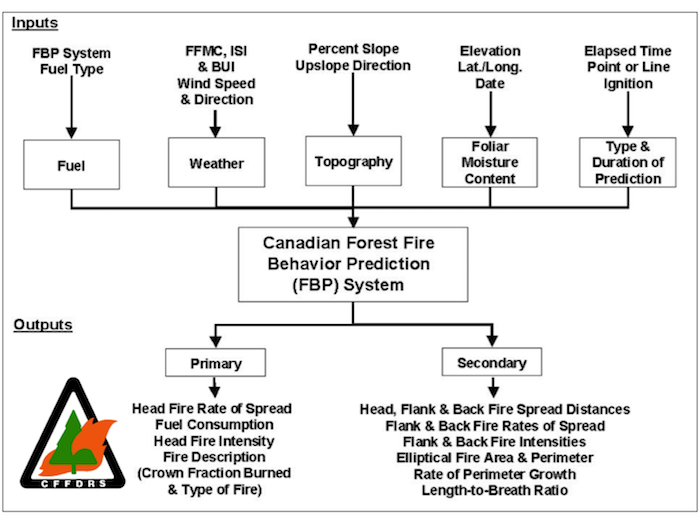 This table identifies the CFFBP Fire Intensity thresholds in kW/m and the corresponding values in English units (BTU/ft/sec) and flame length in feet. These thresholds are consistent with commonly held flame length thresholds for fire safety interpretations in the U.S. system.